Your Suite. 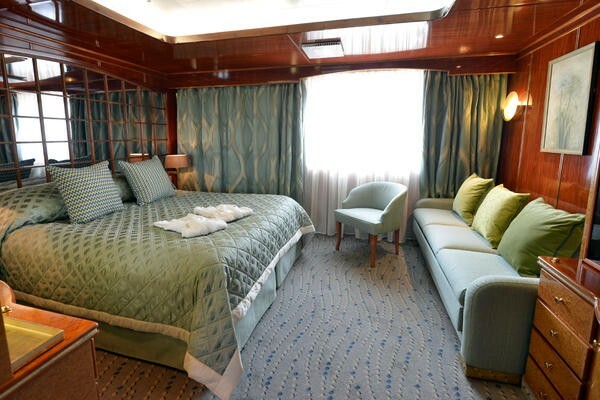 On board there are 59 exceptionally spacious and well-designed suites. All feature a sitting area and fourteen suites have private balconies. 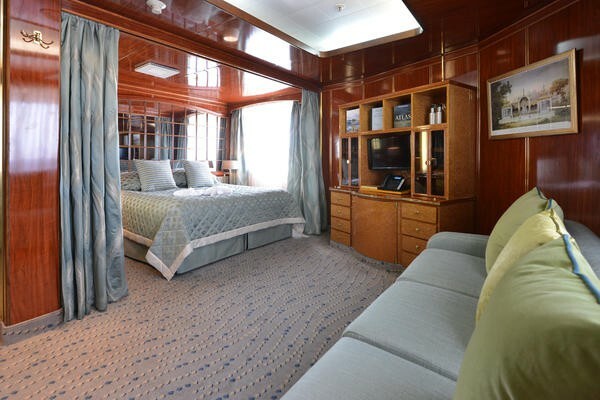 The feeling of luxury is enhanced by the wood panelling and brass which predominates throughout the vessel conveying the atmosphere of a private yacht. 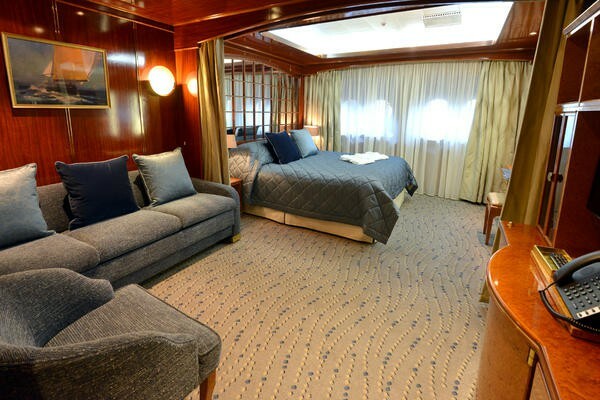 The passenger accommodation is arranged over five decks and all suites have outside views with suites on the Scott and Shackleton Decks featuring private balconies. Each suite affords considerable comfort with en-suite bathroom featuring vanity unit with sink and walk-in rainfall shower, large wardrobes, dressing table with large mirror and stool and excellent storage. There is a minifridge, flat screen television and a telephone in each suite. Refillable water bottles, towelling dressing gowns and slippers are also provided for your comfort. Additional facilities include a programmable electronic safe, hairdryer, assorted Molton Brown toiletries and individually controlled air-conditioning and heating. Soft hues and blended tones enhance the traditional maritime style making the passenger accommodation an inviting and relaxing place to be. The beds in each suite can be configured as twins or double with the exception of suite 601 and 602 which feature fixed double beds. 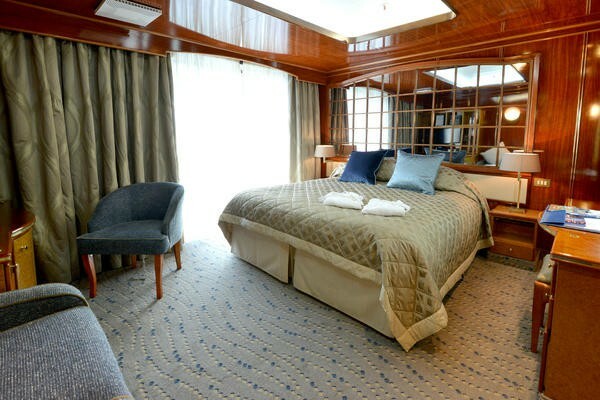 The impressive Hebridean Suite, located on the Shackleton Deck consists of a separate bathroom and sitting room with extra large balcony stretching the length of the suite. Additional benefits of booking this marvellous suite include complimentary mini-bar stocked with your preferences and complimentary laundry. Your Space. 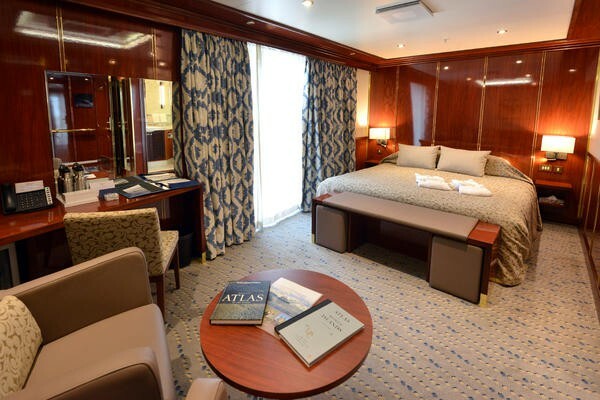 The spacious and finely decorated public rooms on board the MS Hebridean Sky include a large lounge on the Byrd Deck featuring a selection of seating options from individual armchairs and sofas to side cushioned benches. Daily briefings given by the Cruise Director and talks from Guest Speakers and expedition staff take place in The Lounge which is fitted with the highest standard of presentation equipment including multiple screens. 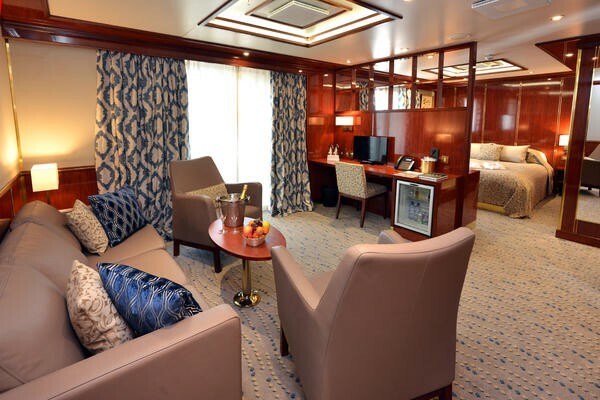 In addition to the Lounge, there is also The Club, located on the Mawson Deck which features the main bar where the onboard pianist plays periodically throughout the day. The Club also offers a 24-hour tea and coffee station. Towards the aft of the ship on the Mawson Deck is The Library which is well stocked with reference books pertaining to the destinations the vessel is visiting and a selection of essential reads. A collection of games and devices to access the internet via the ship’s satellite can also be found in the library. Access to the ship’s satellite Wi-Fi via your own device is complimentary on board (signal strength varies depending on location and demand). The Dining Room which can seat all guests at one sitting is located on the Amundsen Deck and is a bright and charming setting to enjoy the delicious meals on board. Outside there is a rear Lido Deck located on the Scott Deck where meals are served in warm weather under shade. Whilst heaters and blankets make dining al fresco comfortable in cooler climates. Further to this, on the top Shackleton Deck there is an observation area which offers a fantastic platform for spotting wildlife complete with deck furniture, ideal for relaxing with a book or catching up with fellow travellers. You will also find a clinic and Doctor on board and a lift that serves all decks. Additionally there is a small hairdressers with appointments made on request. Your Dining. It is quite a task to create a dining experience as that found on board our Sky vessels when you are cruising in far-flung corners of the globe, indeed it takes a team of highly talented chefs to deliver fresh, varied dishes no matter where you are at sea. Fortunately, our catering teams are well adapted to the world of small ship cruising where no two days are the same and the menus are often scheduled and tailored around the days’ excursions. With only one sitting and a maximum of just over 100 passengers, the cuisine on board is of a consistent superior quality that befits such vessels. Where possible and when it meets their high standards, our accomplished chefs will obtain local produce in markets. Such purchases enhance the well-stocked larders and enable the chefs on board to exhibit their culinary skills and bring a local touch to the varied menus, emphasising the international expertise of the chefs on board. Afternoon tea and pre-dinner canapés take place every day in either the comfort of the Lounge or out on the Lido Deck when the weather is favourable. Tea and coffee are also available 24 hours a day. Special diets can be catered for with sufficient notice. In keeping with the informal atmosphere on board, when dining you are able to choose your seating arrangements at your leisure. Whether that be joining a table of four to six other passengers outside on the Lido Deck in the evening’s sunshine or whether you prefer to enjoy meals in the à la carte restaurant. For those travelling alone, our onboard friendly restaurant staff will take care to ensure you are seated with other like-minded travellers. In the main elegant dining room, breakfast is served buffet-style, with certain items cooked to order on request. Lunch and dinner are à la carte with an excellent choice of dishes, with the menu reflecting the daily catch or local delicacies. To enhance your dining experience even further a selection of wines are included with both meals and there is also a comprehensive wine list with a wide selection of new and old world wines from which to choose. The onboard catering and restaurant staff are experienced at sea and enthuse a passion for superb service. Whether it be ensuring you have an outdoor blanket as you enjoy the crisp sea breeze on the Lido Deck or sharing their knowledge of the characteristics of the days’ wine selections, you will experience a service on board like no other. You may also enjoy sumptuous barbeques on deck whilst at times, the chef will make your dish to order at special pasta or stir fry stations. For Your Comfort. The MS Hebridean Sky is equipped with the latest safety, navigation and communications equipment along with roll stabilizers to minimize the ship’s motion. During your voyage we hope to offer the opportunity to visit the Captain and Officers on the Bridge to check the vessels progress by charts and learn more about your journey. There is also a dedicated channel on your television in your suite showing the routing of the vessel along with technical information and estimated times of arrival and departure from port. On board you will also find a clinic and Doctor and a lift that serves all decks. Smoking on board is restricted to a specific area on deck. Life Onboard. If large resort-style vessels accommodating many thousands of passengers are your ideal, then our ships are not for you as you will not find endless entertainment, round the clock buffets and the people management which is so much a part of today’s big ship on board style. However, if like us you prefer a more peaceful life at sea you will find our flagships the perfect vessels. When choosing your next voyage the choice of vessels is astounding. 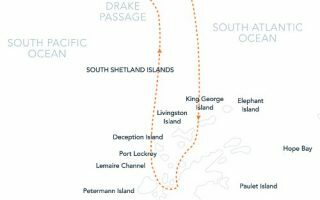 You can select a ship carrying in excess of 4000 passengers with impersonal service or join us aboard the MS Caledonian Sky, MS Island Sky or MS Hebridean Sky where peace, high quality service and attention to detail are the order of the day. We promise there will be no organised entertainment, fancy dress, deck games or any of the usual big ship experiences. Instead, the atmosphere is warm and convivial and more akin to a private yacht or country hotel in which you can learn more about the wonders of nature, culture and ancient civilisations in the company of like-minded people. A little music in the lounge or bar after dinner, Guest Speakers and informative port briefings from our Expedition Leader or Cruise Director and of course good food with wine included at lunch and dinner, all contribute to make any voyage aboard these wonderful vessels a memorable and joyful experience. 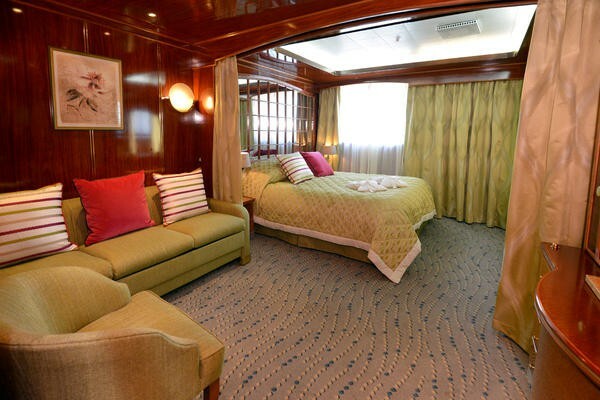 After a day ashore you will return to the comfort and peace of an exceedingly comfortable ship. 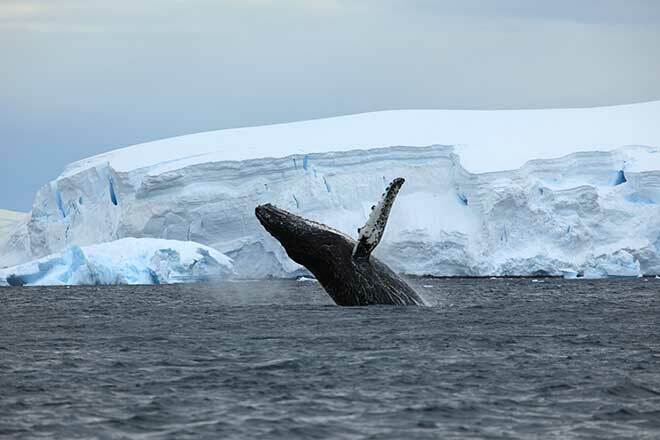 The daily programme on board is in the capable hands of our Cruise Director or Expedition Leader and staff who coordinate with the Captain and Officers to make the most of each day. 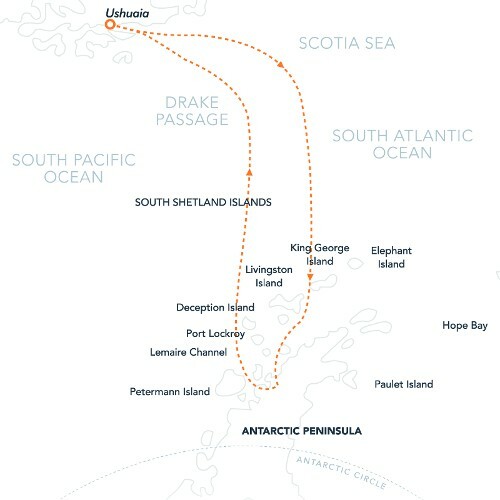 Briefings and talks will be provided throughout the voyage together with a ‘Daily Programme’ that is distributed every evening to your suite outlining the next day’s activities. Dress on board is casual and relaxed and there will be no ‘black tie’ evenings.